Setaria italica (L. ) Beauv. Also Called: Italian millet, german millet, hungarian millet, japanese millet. Culms: Erect or ascending, simple or branched at base, slender but stout, hollow, nearly glabrous, somewhat waxy, rough below inflorescence, nodes often flattened-hairy. Blades: Broad, flat, usually erect or ascending, lanceolate, 8 to 16 inches long, .25 to 1.2 inch wide, glabrous to scabrous; margins rough; tips tapering to sharp points. Sheaths: Overlapping, margins fringed, often pubescent at collar. Ligules: Fringe of hairs from short membranous base. Inflorescences: Panicle, large, heavy, dense, cylindrical to lobed, sometimes interrupted at base, erect or often nodding, 3 to 8 inches long, .5 to 2 inches thick (including bristles), purplish, yellowish, or greenish; rachis soft-hairy; bristles 1-3 per spikelet, rough, up to .5 inch long, usually purplish. Spikelets: 1/10 to 1/8 inch long, bearing 2 florets; lower floret sterile, 5-7-nerved; upper floret perfect; first glume ovate, about one third as long as spikelet; second glume about three fourths as long as spikelet, 5-7-nerved; seeds tawny, red, brown, or black, fall from rest of spikelet when mature. Habitat: Disturbed ground, waste places, fields, and roadsides. Origin: Foxtail millet is a native of Eurasia that was introduced into the U.S. in 1849. It escaped from cultivation and is now naturalized in some locales. Foxtail millet was cultivated in China prior to 2500 B.C. 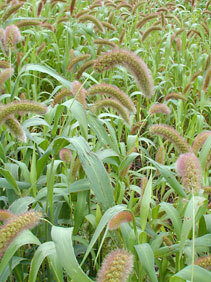 Uses: Foxtail millet is often planted along highways to stabilize soil following road construction. It is also used as a hay and silage grass. Comments: There are a number of different varieties of foxtail millet.